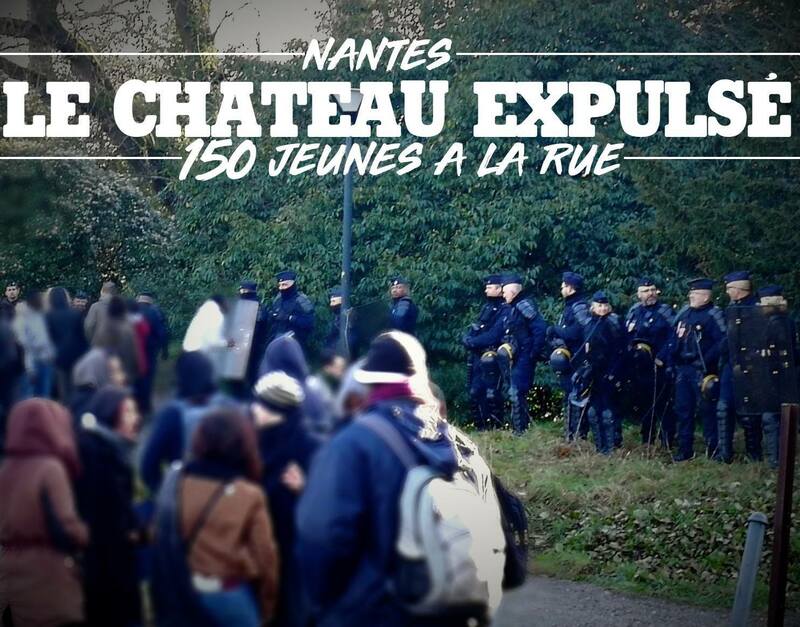 At early hours last Wednesday, the prefecture of Nantes, with the green light of the presidency of the university campus, evicted the Castle of Tertre: a university building occupied by students and refugees last Autumn in order to house child migrants. 300 cops took part in a very swift operation which made 150 young people homeless. The eviction took place after a few months of unsuccessful negotiations with both University and the local government. Originally published by Freedom News. Images by Nantes Révoltée Faceook page. Castle of Tertre occupation started towards the end of a students party held at its premises. The students, along with refugees, took over 888 m² of space spread over three floors, in order to house unaccompanied minors. Since then, the occupation met with police harassment, legal action in order to evict it, and attacks from local fascists. In December, despite of ongoing negotiations with the occupants, the university obtained eviction order. Following the police eviction, a mysterious “Commando Nicole” has painted the university headquarters in solidarity with displaced migrants. Almost immediately after the eviction, a new building in Nantes was occupied in order to house displaced minors. It is the fourth occupation in solidarity with refugees in recent months in Nantes. The new building is a property of Nantes prefecture. The desperate situation of refugees in France continues, and it is causing an ever-growing outrage among French students, with occupations and protests in numerous cities.